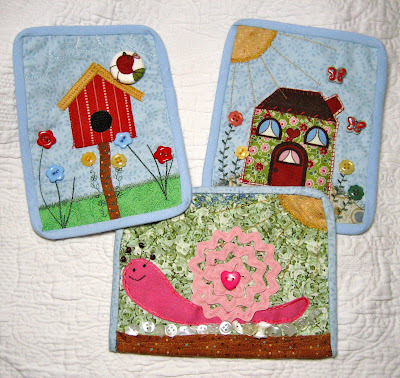 Sandra Kaye: Quiltie Trade #1 Show and Tell!! Sandie, the quilties are absolutely beautiful and I would love to participate in the Christmas trade. The ladies are so talented and you can tell there was a lot of thought put into their creations. The pictures and links to their blogs is a bonus! Hi sweet Sandie, You did an awesome job on your post, what a great array of Quilties and I'll watch for your next post on the holiday trade. Have a wonderful weekend! 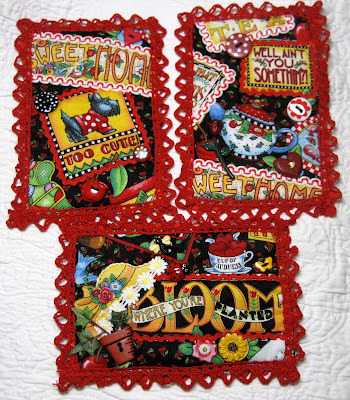 Hugs, Marilou aka your "blogmama"
What a lovely collection of quilties. I'm going to trade for the Christmas theme so sign me up. Thanks for having the Quiltie Parade! I love them all. And thanks for being such a great hostess! I am in for Christmas! Son preciosos. Muy buenas manos. The Quilties are fabulous! What a fun thing to do. You never know--someday I might just have to try making one. At least that's a size I could manage! These are GORGEOUS. Everyone did such a great job!! I am definitely signing up for the Christmas trade! I just love the quilties! You have some talented followers! They are just adorable! Oooh ... I want to join in the fun too. I can't remember whose blog I was reading and followed her link here but aren't those a lot of fun. Any other information about the size/style etc available or will that be coming soon. B.